I was walking my dogs along a snow-covered dirt road, bundled up since the temperature was in the teens. A black-tailed jackrabbit emerged from the base of a large sagebrush to sprint down the road. My rat terrier took off in pursuit but soon gave up, having learned long ago it has no chance of catching a jackrabbit. My Jack Russell, nicknamed Tubby, merely watched the chase before walking over to smell around the sagebrush. I walked over and knelt beside the sagebrush. Removing my glove, I felt the matted, dry leaves inside this jackrabbit’s scrape where its last bit of warmth remained. 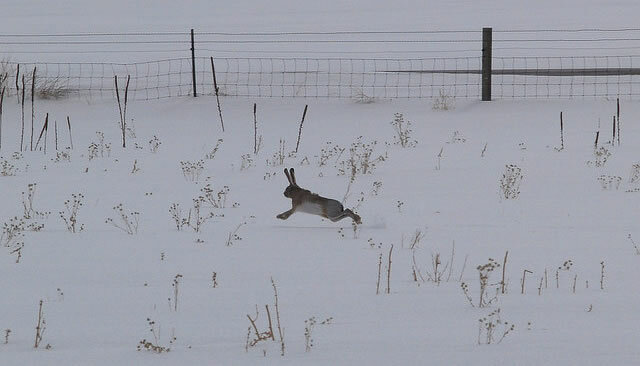 Jackrabbits in winter cold always make me wonder how they survive living among sagebrush. I have heard people say they just go into their burrow, but the black-tail jackrabbits are not rabbits, but hares. As such, they do not dig underground burrows. Nor do they use other animals’ burrows. 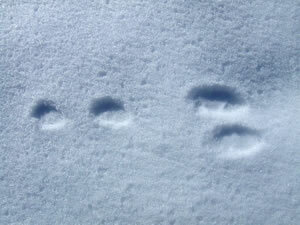 About their only form of protection against winter cold are their scrapes they form at the base of shrubs. These cup-shaped indentations offer protection from winter winds. They are barely large enough for jackrabbits, so they create warm microclimates for those frigid nights and days, when not feeding. They do not hibernate since sagebrush offers a constant winter food supply. Sagebrush is a great shrub for winter wildlife since it retains its leaves over winter. Jackrabbits’ extremely large ears, about a third of their body length, are usually thought to help them hear but these long appendages also help regulate their body temperature. The ears are rich with blood vessels and in summer heat, these blood vessels expand. Spread ears and summer breezes cool the blood. During winter, these ears are held against the body and their blood vessels constrict so they lose less heat to the cold air. They are always vigilant for predators, since they are the principal prey of golden eagles, along with being an important food source for coyotes, ravens, owls and hawks. When predators approach, jackrabbits duck down to hide, slowing their heartbeat. If predators approach too near, something like myself and my dogs, their heartbeat speeds up to three times the normal rate, pumping oxygen-rich blood to their muscles. They then run away at speeds up to 50 mph, and few dogs can catch them. They also run in a zigzag pattern to confuse predators, and perform high leaps, up to 15 feet in length. My rat terrier can about stay even with a jackrabbit dumb enough to run down a road, but as soon as the jackrabbit veers into the brush and starts zigzagging it is all over. This jackrabbit is probably crouched down somewhere nearby and will soon return to its warm scrape.